Most of the northern range of mountains in Trinidad are made up of limestone which in turn has a selection of cave systems. 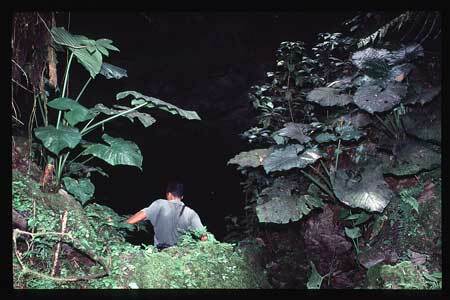 The mountains reach to just above 3000ft and are densely forested making cave exploration very difficult. 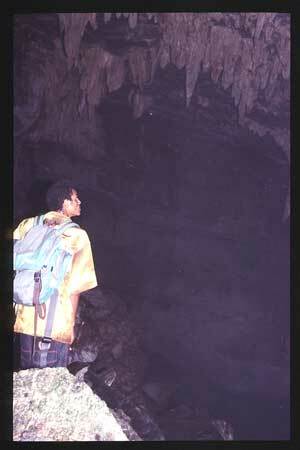 With just a week on Trinidad in October 2001, mostly bird watching, I wasn't able to find out a huge amount about the caves, but managed to hire a guide (who was essential) to take me to Aripo Caves. Starting from the Asa Wright Nature Centre, where I was staying, Dave the driver/guide took me to Aripo village where he decided we needed another guide called Harold because he knew the way. After a lot of searching we managed to track Harold down. He decided that he needed his brother Gregory to help us get to the cave as he knew the trail well. So here I was with three Trinidadian guides! (Luckily I had paid back at the centre!) We all loaded into the car and headed off up the pot holey road towards the mountains. Dave I must say was a very skilful driver as the road only seemed suitable for 4-wheel drives, and his saloon car only scraped the bottom once. We parked up beside the road, way on up from Aripo, only having passed the occasional smallholding in amongst the forest. Although Dave was worried about the car being broken into I couldn't imagine any sane driver using the road and there may have been locals, ...but where? 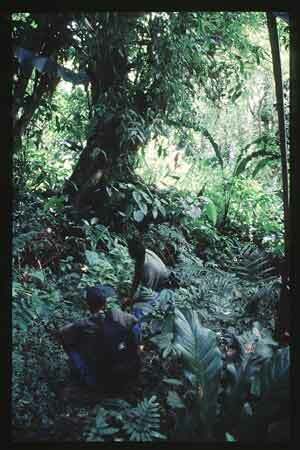 Rations packed, water bottles carried, we set off into the forest with Gregory carrying my ruc-sac. (Spoilt or what!) Dave kept telling me it was going to be very difficult and it would take at least two hours to get to the cave. 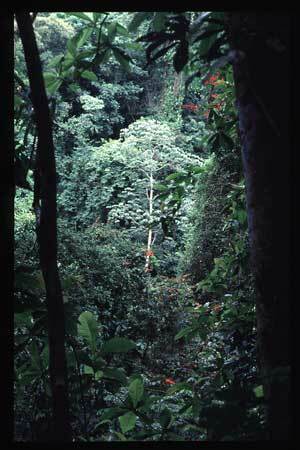 We plodded up a well defined track, to start with, through thick forest covered with vines and epiphytic growth. 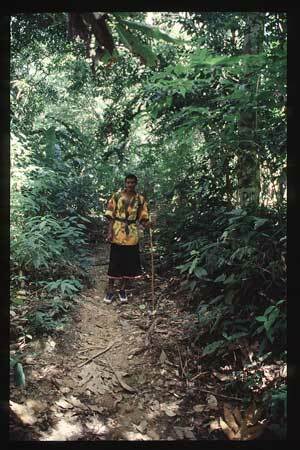 Heliconias, (the leaves resemble the banana tree), covered the ground on either side of the trail. To start with there was no sign of limestone. After about half an hour steady plodding with frequent water stops, as it was very hot, the first limestone started erupting through the Heliconias. It was wonderful fluted limestone and I began to get excited as I hadn't seen any sign of limestone, (apart from in quarries) all week and was beginning to think the stuff didn't exist! As far as I could see there were plenty of small sink holes and wished I had time to investigate further, (with Gregory bashing the snakes out of the way first of course!) We plodded on up and down two steep ridges with a small amount of scrambling on the small cliffs. We halted at the top of the second ridge for a quick peep through the trees, to El Cerro del Aripo (the highest mountain at 941m) across the valley. I felt that we were pretty high up ourselves, as although we weren't level with the top of the mountain we were a good way up. There was quite an unpleasant smell at the top of this ridge and I thought there was a rotting animal somewhere, but evidently it was the smell of the Oilbirds guano. We were close. After reading a "Keep the countryside litter free" sign , that was surrounded by a small amount of litter, we headed down the steep hill to a dry river bed. A few metres down this, the cave entrance could be seen. Our walk had taken us about an hour and a half and it hadn't been that difficult. The entrance of the cave was about 40ft high (ish) and perhaps a bit more wide. A small slippery climb and scramble over boulders brought us to a level area at the cave mouth. The Oilbirds were making quite a racket...the Amerindians called them the Guacharo birds which means "the one that wails and mourns". The Oilbird is the only nocturnal fruit eating bird in the world. It is found in Columbia, Venezuela, Guyana, Ecuador, Peru, Bolivia and Trinidad. It is a large bird measuring 18 inches from beak to tail and has a wing span of 36 to 42 inches. 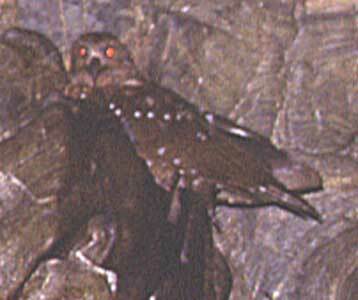 It navigates in the dark by echo-location and uses it's eyes when there is adequate light. Evidently they can detect an object up to eight inches in diameter in total darkness in their cave. Oilbirds eat the fruit of various forest trees. Palms, laurels, incenses and camphor...all fruits having a relatively large seed surrounded by a firm pericarp. They swallow the fruit whole, digest the pericarp and then regurgitate the seed. They can travel up to 70 miles from their cave to feed, which they do by hovering...(pretty large humming bird!!!!!) 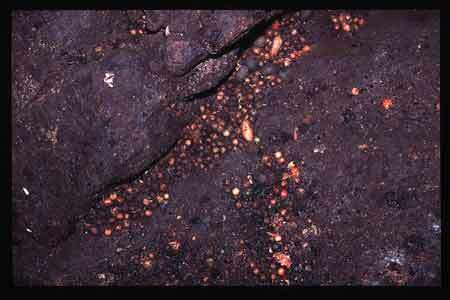 Their nests are made mostly of regurgitated matter, about 15 inches in diameter with a raised rim and stuck to ledges in the cave. Two to four eggs are laid and both parents incubate for about 33 days. The young develop very slowly and do not leave the nest for 95 to 120 days after hatching. At about 70 days the weight of the young is about 50% more than the adults. They have a tremendous oil content (hence the name) and the Amerindians would collect them from their nests and render them down for their oil. This was used for cooking and also fuel for torches. It has also been said that by shoving the bird on a stick and lighting it (dead, one presumes!) it would stay alight for a fair few hours. A pretty good source of lighting one supposes! Any way back to the cave. Dave and Harold announced that this was as far as we could go....as it was dangerous to go any further! Luckily I had read a small description of the cave in the Rough Guide of Trinidad and Tobago and knew well that the entrance was not as far as I was going! I donned my headtorch, basically told them that I was going further, so Gregory and I climbed down the slippery guano covered rocks. The climbs had plenty of hand holds and as long as one was really careful not to slip (I didn't want to ruin my camera!!) it was easy. We went down about 100 metres maybe and stood under the now frenzied Oilbirds. The noise was terrific. 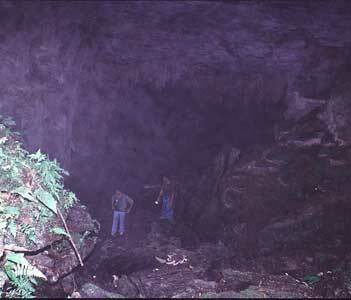 It was hard to see too much with only one torch but I think the roof of the cave was 40 or 50 feet high. I could see the passage disappearing off to the right down another slippery slope, which goes on for another 150 metres before an 8 metre pitch (so I have since found out). The entrance way up behind us looked tiny. Due to the fact that Gregory had no light and I knew that there was one of the two pitches fairly close, we made our way out after taking a couple of photos, one of the birds and one of the large seeds in the guano. Harold and Dave had upset some army ants when climbing out onto the dry river bed, to wait for us, so it was an amusing climb as it's not easy hanging onto a SLR trying to avoid bashing the lens, at the same time as dancing over very slippery limestone trying to avoid being bitten. On the way back to the car we had time for a bit of nature watching. Blue Morpho butterflies flopped up and down beside the streams that we had to cross. Kingfisher blue and about 6 inches, they never stayed still long enough for a photo. Dave made bird sounds and called in a Collared Trogon, a stunning bird of red and green with a white stripe across it's chest. A baby snake shot off into the undergrowth. We got back to the car, which was untouched, to Dave's relief. Gregory was certainly a good guide but didn't seem to speak much English...Harold was the business man of the family...they are keen to be contacted and between them would give people a good trip to the cave. Gregory has been down the pitches so presumably with a little organisation and kit, the cave could be explored properly. Evidently it has not yet been bottomed properly. This cave I also visited. 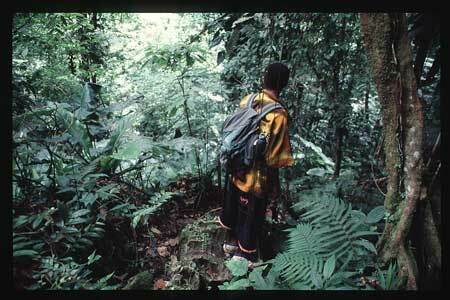 It is in the grounds of the Asa Wright Nature Centre and also has Oilbirds in residence. Access is limited to twice a week with a guide from the centre. The cave is not in Limestone but an igneous rock of some sort and is a narrow passage breaking it's way through a huge lump of rock blocking the small river and valley. It would be a quick through trip of a few metres down the streamway as I could see daylight from where we stood. Because the Oilbirds are protected access would be impossible. Walks to Aripo Cave, Oropuche Cave and Tamana Caves are mentioned in ffrench and Bacon's Nature Trails of Trinidad although a friend who lives in Trinidad tells me that the route finding is difficult on some walks as things have changed and grown since the book was revised in 1992.